Join the discussion on our forums! 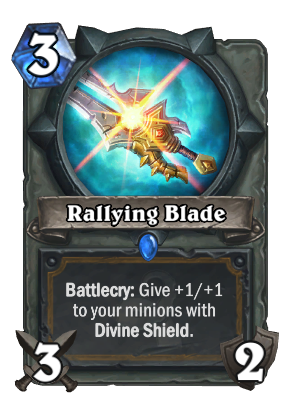 Come discuss Rallying Blade over in our dedicated Rallying Blade discussion topic. Battlecry: Give +1/+1 to your minions with Divine Shield. As far as blades go, this one is pretty great in the motivation department. Because the art IS Shalamayne. Steward of Darkshire plus Stand Against Darkness then Coin this = profit. This card is SO good in wild. I don't like the fact that it's a 3 mana 3/2, however in a Reno deck, it appears to be the better friend for Truesilver Champion compared to Argent Lance. As someone else pointed it out to me the other day, some of the more threatening cards that you would want to remove right away all have 3 health, like the Northshire Cleric. This fellow will do his work removing those pesky 3 hp minions. Say hi to my Blood Knight!